We are very familiar with Mohideen Baig’s version of ‘Buddham Saranam Gachhami’ song since our childhoods. This is the song most played during Wesak. This is the song played with loud speakers whenever a religious event or drama showing (Jahuta) was held in the village temple. We can remember how excited we were when we heard the van with the loudspeaker came and how we ran after the van to hear the last sound of the song. To be frank, Mohideen Baig’s Sinhala version was more powerful than its original Hindi version as Baig Master had a more commanding voice. I heard once Baig’s son saying on TV that the original singer, Manna Dey himself had told Baig’s version was better. I am not too sure whether this claim is true though. 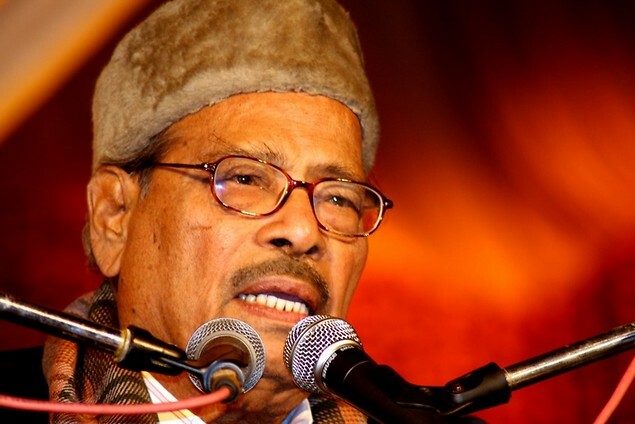 The sad news is that Manna Dey, the original singer of Buddham Saranam Gachhami (Angulimaal -1960) has passed away last night at the age of 94 at a Bengaluru hospital after a long illness. However, I started liking Manna Dey after listening to Yeh Dosti song from the film Sholay. I immediately recognized Kishore Kumar’s voice in the song when I first listened to it but didn’t have a clue who the other singer was. But I later learnt over radio that it was Manna Dey. I started liking him since then. Dey was one of Indian cinema’s finest golden voices. It is reported that Dey ensured that old songs to be played beside his bedside with the help of his daughter even at the last few days of his life. Dey was born as Prabodh Chandra Dey on 1 May, 1919, and Manna Dey was only his nickname which became his stage name of late. He sang in a number of languages– Hindi, Bengali, Gujarati, Marathi, Malayali, Kannada, Assamese, Bhojpuri, Awadhi, Magadh, Punjabi, Maithilee, Konkani, Sindhi and Chhattisgarhi. Dey’s career as a playback singer started with the movie Tamanna in 1943. His uncle, Krishna Chandra Dey composed the music and he paired up with the well-known Suraiya to sing this wonderful duet. The entire nation madly loved this song and Dey became a household name within few days. Dey shared the limelight with some legends like Mohammed Rafi, Talat Mehmood, Mukesh and Kishore Kumar. Manna Dey teamed up with great singers like Bhimsen Joshi and belted out a legendary song known as Ketaki Gulab Juhi. With Kishore Kumar he sang a completely different genre of songs like Yeh Dosti (Sholay) and Ek Chatur Naar (Padosan) that became very popular. In the Bengali film industry, he worked with noted musicians like the legendary Hemant Kumar. He established himself in mainstream Bengali music after his legendary duet song with Lata Mangeshkar known as Ke Prothom Kachhe Esechi. Mohammed Rafi in fact once told that though people listen to his songs, he himself enjoys only Manna Dey’s songs. Dey sang over 4,000 songs. He has sung with singers of every generation in Indian films from 1940-2005. He has worked with more than 102 music directors in Hindi film industry from working with Krishna Chandra Dey in Tamanna in 1942 to music composer Shamir Tandon in 2006. Manna Dey infused the melody of classical music in the frame of pop music. Dey showed his singing talent in early days of school when he used to beat tables and sing to entertain his classmates. He then started to receive proper training in music from his uncle Krishna Chandra Dey and also from Ustad Dabir Khan. In 1942, Dey started working as an assistant music director under his uncle and then under S. D. Burman. After assisting many music directors, he eventually started to work independently. Dey had been honoured with the Padma Shri in 1971, the Padma Bhushan in 2005 and the Dadasaheb Phalke Award in 2007. Dey may have left us, but he will continue to live with his music. He is survived by his daughters Shuroma and Sumita. His wife, Sulochana, died of cancer last year. Manna Dey toured Sri Lanka once. In addition to his songs, he sang Dayarathna Ranathunga’s ‘Jaya Siri Maha Bodhi’ on stage. This video is available with Rupavahini. Information about Manna Dey was taken from www.firstpost.com with only minor changes to the original text.